So, usually it's me, Sophie, that does all the posting on Team Tunnah Evening, but today, it's Andrew's turn!! 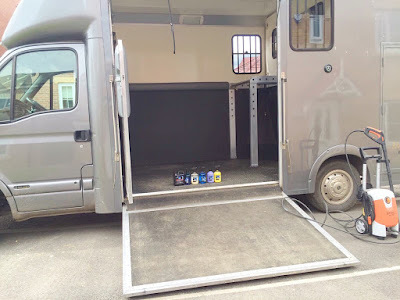 Getting Louie show ready - training and cleaning - is very much left up to me, but there's also the horsebox to consider, which is definitely a job I leave firmly up to Andrew! Here it is - Andrew's first blog! Luckily for me, this task falls to Sophie.. And believe me, she has all the lotions & potions to remove the stains from Louie, make him gleaming white & have him look his best!! I however, the unpaid groom, get the job of making sure everything else is up to standard including the cleaning of tack, boots and, of course the all important, ‘Louie’s Lorry’. 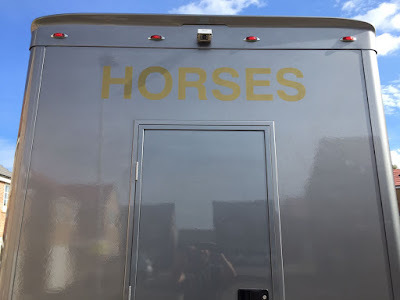 We bought the horsebox five years ago & it is Sophie’s second pride and joy (obviously Louie comes first!). I know I'm not topping that list!! Without it she simply couldn't get to her training sessions or competitions. One of my biggest bug bears is a scruffy, dirty lorry. Inevitably it’s going to get dirty - you are driving on country roads, fields & you have a horse in the back that leaves you a couple of presents to make sure you know he has been in there!! I get a lot of satisfaction on making sure we have the horsebox as clean as it can possibly be, inside & out. OK, I might have a slight OCD... But, like painting the Forth Bridge it can feel like it is an endless but is always a rewarding one. 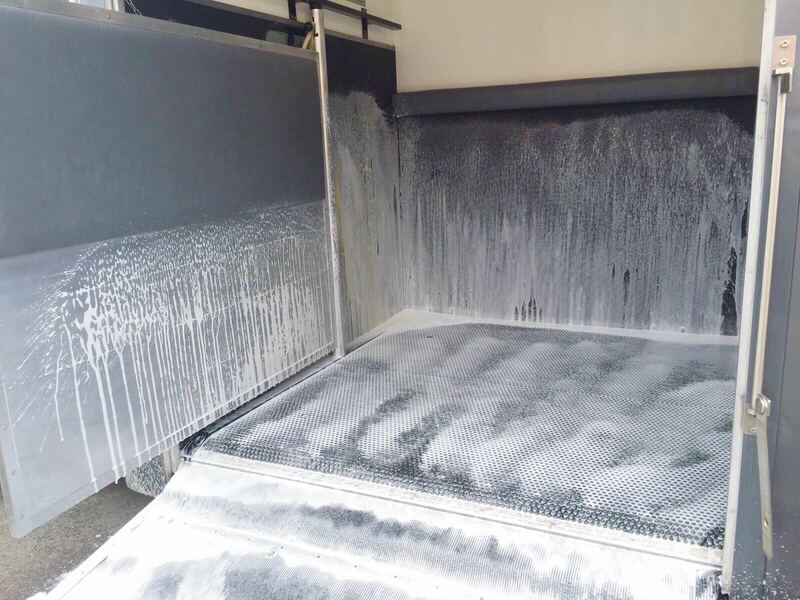 For years, I have used Auto-Glym products to clean the vehicle, and in all fairness, up until recently I was rather impressed with the results, except for the white residue the ‘Resin Polish’ left. 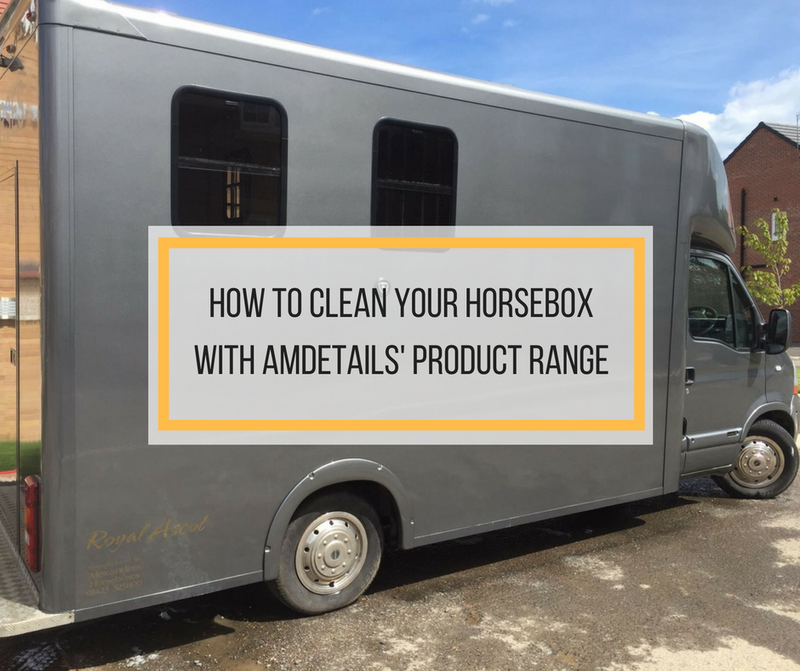 In search of new & better ways of cleaning the horsebox I came across AMDetails on Facebook & started to watch a couple of the quirky and informative videos they produced. Alan very kindly sent me a goody box of his products to try on the horsebox & I can’t tell you strongly enough how impressed I was with them instantly!! 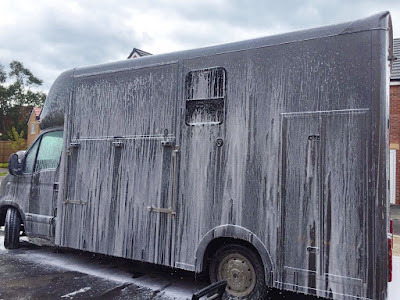 The snow foam was a revelation, & having left it to soak on the horsebox was amazed how much dirt came off with the jet wash rinse. What amazed me most with the snow foam was how easily it removed the muck left behind inside the horse area of the box. I normally have to spend a good 30 mins scrubbing the rubber matting to remove it but in just 5 minutes of soaking and a good jet wash and it was job's a good-un. Next, I set about using the AM Bubbles Luxury Shampoo using the two bucket method as advised by Alan. 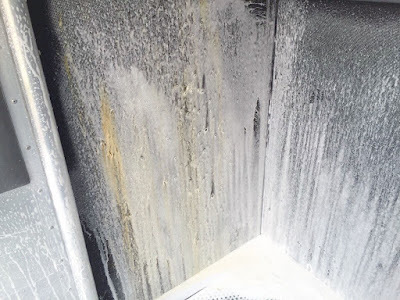 The quality of the product was fantastic and left a nice gleam on the paintwork, plus I was amazed at the amount of dirt, grit and residue that was left in the rinse bucket. Nothing better to show me just how dirty the horsebox was!! Next up was the AM Glaze which certainly helped further clean the paintwork. I applied using one of the applicator pads that come with the set of products. It was very simple & easy to use - much better that the Auto-Glym polish I had previously used. I buffed the glaze off with a myofibril cloth before using AM Seal which came in a spray making it extra easy to apply using the form applicator pad. Again, I buffed the sealer with a myofibril cloth to leave the paintwork looking smooth, glossy and shiny. Finally, to complete the clean, I used the AM Glass Cleaner to finish off the glass work and leave the horsebox looking like it had just come out of the showroom!! 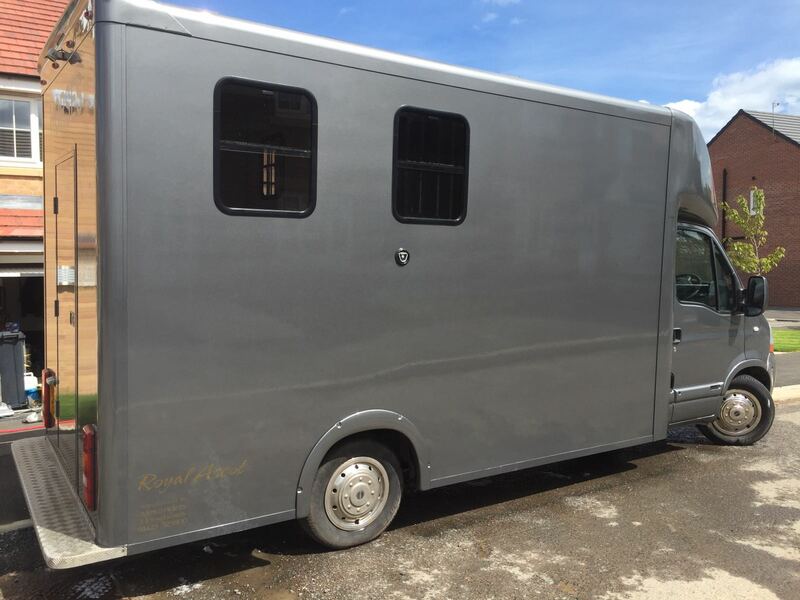 I highly recommend the AMDetail products to anyone who, like me, likes a shiny, smooth & glossy looking vehicle - whether that be your everyday car or your horsebox. 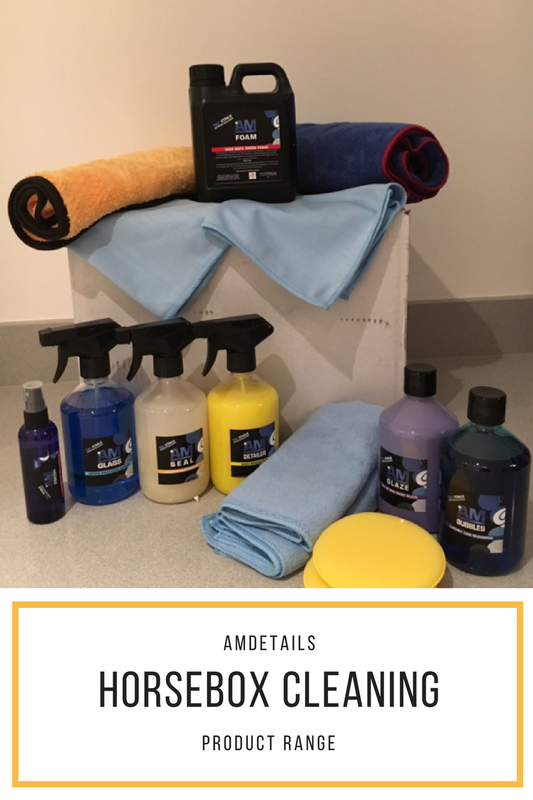 If you've enjoyed Andrew's first post about how best to clean your horsebox, be sure to pin it for others to discover the AMDetails cleaning product range! Good work and job well done. Where were you when I had a horse trailer? Ours was a 5th wheel, 2 horse and was pretty easy to keep clean but you are a PRO! Well that is a well looked after trailer! Hi Andrew! Great job on the blog post and nice to "meet" you. The horse box looks amazing. I'm sure he'll be very pleased to hear the nice comments on his cleaning skills!! Wow! Incredible difference. Yay for horse-husbands! Superb guy's top job. Fantastic to see the different applications for our range. ha ha ha. Amazing Sophie. Keep up the great work guys.